CRN YACHTS is an Italian shipyard founded 1963 by Sanzio Nicolini that has made its reputation worldwide as an icon of Italian excellence for over 50 years. Joining the Ferretti Group in 1999, CRN has continued building custom steel and aluminum superyachts from 131′ to 295′ (40m to 90m). 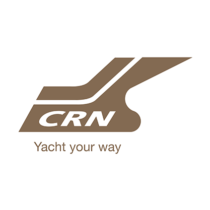 With a fleet of nearly 200 vessels worldwide including commercial and military ships, CRN’s passion and innovative design are what distinguishes them as one of the best yacht construction and interior design companies in the world. World-class new yacht construction by CRN includes the 242′ (74m) CLOUD NINE, the 262.47′ (80m) CHOPI CHOPI, the 190′ (58.2m) J’ADE and more. As a premier luxury yacht builder, CRN yachts works with the world’s finest interior and exterior designers including Francesco Paszkowski, Omega Architects, Nuvolari Lenard and others, to create a yacht with thoughtful precision and detail to the client’s liking. Browse the entire fleet of CRN yachts for sale or find an CRN yacht for charter below. For more information about CRN yachts for sale and your own custom tailored yacht report, or to book a CRN yacht for charter, simply contact the Merle Wood & Associates luxury yacht brokerage firm.